Tours to the 88-temple Shikoku pilgrimage and the sacred mountain of Koyasan (Mt. Koya) in Wakayama have received international attention as Japan’s in-bound tourism to those two sites has increased year on year in the lead up to the 2020 Olympics. Yet, the Buddhist monk behind the existence of the pilgrimage and the founding of the temple complex at Mt. Koya — Kōbō Daishi Kūkai — and the impact that he and the Shingon Buddhist movement had on Japan is less well known. At this workshop, three leading scholars of Shingon Buddhism will discuss the hagiographies of Kūkai, the social impact of his school of Buddhism on medieval Japan, and how this school’s new esoteric practices intersected with other Buddhist movements. 10:15 am "The Eventful Afterlife of Kōbō Daishi Kūkai: The Role of Kūkai Hagiography in the Foundation of the Shingon School"
12:45 pm "Esoteric Buddhist Responses to Social Disorder in Heian Japan"
2:30 "Medieval Koyasan and Esoteric Pure Land Buddhism in Practice"
"The Eventful Afterlife of Kōbō Daishi Kūkai: The Role of Kūkai Hagiography in the Foundation of the Shingon School"
Kūkai is perhaps one of Japan's most renowned intellectuals. As a historical figure, his writings on Buddhist doctrine and ritual were seminal to the development of Japanese religion and culture. Students of Japanese religion also know him as the founder of the Shingon school and for introducing the esoteric Buddhist tradition to Japan. However, before he became "Kūkai the Founder" he was worshipped under the title of the "Master who Spread the Dharma" (Kōbō Daishi). 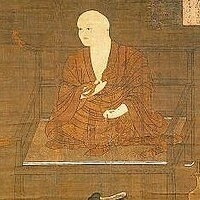 According to medieval biographies, Kūkai not only succeeded at propagating the esoteric teachings in Japan during his lifetime but continues to preach in Tusita Heaven alongside the future buddha Maitreya with whom he will return to this world and once again promulgate the Buddhist teachings. Modern scholarship on Kūkai has endeavored to separate the historical data preserved in these legends from the tales of the medieval Kōbō Daishi cult. In result, we are left with two narratives of Kūkai: Kūkai the Buddhist intellectual and Kōbō Daishi the supernatural legend. Such legends are often depicted as fanciful elaborations on the life and work of a pioneer of Japanese Buddhism, whose teachings inspired devotion and whose legacy became the object of worship for a medieval cult. However, this dual narrative—historical and legendary—was not a diachronic development. A thorough examination of the hagiographical literature reveals that the image of Kūkai as superhuman predated the notion of Kūkai as founder and was, moreover, fundamental to the construction of a Shingon school. In other words, our modern view of Kūkai the intellectual was predicated on the medieval interpretation of Kōbō Daishi as a supernatural being. "Esoteric Buddhist Responses to Social Disorder in Heian Japan"
This paper will elucidate the doctrinal and ritual strategies by which the Tendai tradition established its indispensability to the Japanese state of the late ancient period. Through analysis of commentaries on esoteric rites in the works of scholar-monks in the Tendai tradition and a consideration of the early developments of ritual practice, this paper will show how ritual technologies for the pacification of “evil” obstructions were conceptualized and why they were believed to be particularly efficacious, and thus essential, to the state’s mission of protecting itself and its people from calamities and other malign influences. By doing so, it aims to contribute to our understanding of how the thaumaturgical dimension of esoteric Buddhism—long held to be one of its hallmark features—was revised and enhanced by monks of the Tendai school and how this enhancement enabled a new rapprochement between the Japanese state and the Buddhist establishment. "Medieval Koyasan and Esoteric Pure Land Buddhism in Practice"
Kūkai is commonly regarded as the founder of the Shingon School of Esoteric Buddhism, a form of Mahayana Buddhism that promises the immediate attainment of Buddhahood in this very body. Esoteric Buddhism is often contrasted with Pure Land Buddhism, a form of Mahayana Buddhism that is said to promote awakening in the next life, in the Pure Land. With Esoteric Buddhism's focus on "this world" and Pure Land Buddhism's focus on "that world," how could it be that these two seemingly diametrically opposed approaches to Buddhist salvation could have anything in common? In this paper, I will examine the often-overlooked role that aspiration for rebirth in the Pure Land has played in the popularization of the worship of Kūkai and the practice of the Shingon tradition. Matthew McMullen is a permanent research fellow at the Nanzan Institute for Religion and Culture in Nagoya, Japan, where he serves as editor of the Japanese Journal of Religious Studies. He also assists with editing for the Digital Dictionary of Buddhism and is a network editor for H-Buddhism. Matthew is currently Assistant Professor in the Faculty of Humanities at Nanzan University. Eric Haruki Swanson is a PhD Candidate in the East Asian Languages and Civilizations department at Harvard University. Before starting his program at Harvard University, he spent three years at Koyasan University where he received a Masters in Esoteric Buddhist Studies. His current research focuses on how Buddhist discourse and ritual practice helped to formulate notions of social order in pre-modern Japan and he is particularly interested in the intersections between religious thought, ritual, and artistic performance. Professor Aaron P. Proffitt, PhD, is an assistant professor of Japanese studies in the East Asian Studies Department at the University at Albany-SUNY. His monograph, Esoteric Pure Land Buddhism in Early Medieval Japan: A Translation and Analysis of Dōhan’s Himitsu nenbutsu shō, is under contract with the Pure Land Buddhist Studies Series through the University of Hawaii Press. This work examines Esoteric Pure Land Buddhist thought and practice in China and Japan through the lens of the Kōyasan scholar-monk Dōhan (1179-1252), and will contain the first fully annotated English language translation of all three fascicles of the Himitsu nenbutsu shō.